The NewsLine: The iron pillar of Delhi. The iron pillar of Delhi. The approximately 24-foot- (7-meter-) tall, 6-ton iron pillar located in the famous Qutb Minar complex of Delhi, India, is one of the world's foremost metallurgical curiosities. A testament to the advanced skill of ancient Indian ironsmiths, it is the last remaining part of a Hindu temple erected by 5th-century ruler Chandra Gupta II. Although it is about 1,600 years old, the pillar has never corroded. The iron pillar of Delhi, the capital city of India, is one of the world's foremost metallurgical curiosities, standing in the famous Qutb complex. The pillar—almost seven meters high and weighing more than six tons—was erected by Chandragupta II Vikramaditya (375-413). It is the only piece of the Hindu temple remaining, which stood there before being destroyed by Qutb-ud-din Aybak to build the Qutub Minar and Quwwat-ul-Islam mosque. Qutub built around it when he constructed the mosque. The pillar is made up of 98% wrought iron of pure quality, and is a testament to the high level of skill achieved by ancient Indian iron smiths in the extraction and processing of iron. It has attracted the attention of archaeologists and metallurgists as it has withstood corrosion for the last 1600 years, despite harsh weather. The pillar, almost seven metres high and weighing more than six tonnes, was erected by Chandragupta II Vikramaditya (375 AD–414 AD), (interpretation based on careful analysis of archer type Gupta gold coins) of the Gupta dynasty that ruled northern India 320–540. The pillar with the idol of Chakra at the top was originally located at a place called Vishnupadagiri (meaning “hill with footprint of Vishnu”). This place has been identified as modern Udayagiri, situated in the close vicinity of Besnagar, Vidisha and Sanchi. These towns are located about 50 kilometres east of Bhopal, in central India. There are several aspects to the original erection site of the pillar at Udayagiri. 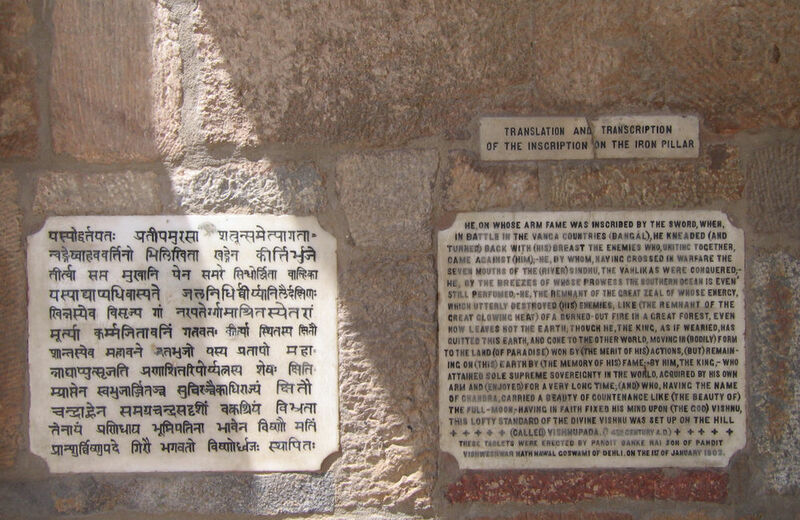 It must be worth noting that Vishnupadagiri is located on the Tropic of Cancer and, therefore, was a centre of astronomical studies during the Gupta period. The Iron Pillar served an important astronomical function, when it was originally at Vishnupadagiri. The early morning shadow of the Iron Pillar fell in the direction of the foot of Anantasayain Vishnu (in one of the panels at Udayagiri) only in the time around summer solstice (June 21). The creation and development of the Udayagiri site appears to have been clearly guided by a highly developed astronomical knowledge. Therefore, the Udayagiri site, in general, and the Iron Pillar location in particular, provide firm evidence for the astronomical knowledge that existed in ancient India around 400 AD. Inscriptions have survived the test of time on the iron pillar. The pillar bears an inscription in Sanskrit which states that it was erected as a standard in honour of the Hindu god, Vishnu. It also praises the valor and qualities of a king referred to simply as Chandra, who has been identified with the Gupta King Chandragupta II Vikramaditya (375-413). He, on whose arm fame was inscribed by the sword, when, in battle in the Vanga countries, he kneaded back with breast of the enemies who, uniting together, came against (him);-he, by whom, having crossed in warfare the seven mouths of the (river) Sindhu, the Vâhlikas were conquered;-he, by the breezes of whose prowess the southern ocean is even still perfumed;- (Line 3. )-He, the remnant of the great zeal of whose energy, which utterly destroyed (his) enemies, like (the remnant of the great glowing heat) of a burned-out fire in a great forest, even now leaves not the earth; though he, the king, as if wearied, has quit this earth, and has gone to the other world, moving in (bodily) from to the land (of paradise) won by (the merit of his) actions, (but) remaining on (this) earth by (the memory of his) fame;- (L. 5. )-By him, the king,-who attained sole supreme sovereignty in the world, acquired by his own arm and (enjoyed) for a very long time; (and) who, having the name of Chandra, carried a beauty of countenance like (the beauty of) the full-moon,-having in faith fixed his mind upon (the god) Vishnu, this lofty standard of the divine Vishnu was set up on the hill (called) Vishnupada. Made up of 98% wrought iron of pure quality, it is 7.21m (23 feet 8 inches) high, with 93cm buried below the present floor level, and has a diameter of 41cm (16 inches) at the bottom which tapers down on going up. The pillar was manufactured by forge welding. The temperatures required to form such a pillar by forge welding can only be achieved by the combustion of coal. The pillar is a testament to the high level of skill achieved by ancient Indian iron smiths in the extraction and processing of iron. A fence was erected around the pillar in 1997 because people were damaging the pillar. There is a popular tradition that it was considered good luck if you could stand with your back to the pillar and make your hands meet behind it. Metallurgists at IIT Kanpur have claimed that a thin layer of "misawite", a compound (amorphous phase d-FeOOH) of iron, oxygen, and hydrogen, has protected the wrought iron pillar from rust. According to them, the protective film took form within three years after erection of the pillar and has been slowly deepening since then. This information was wrongly flashed by the news media based on an article that appeared in Current Science. In the original article in Current Science, it has been mentioned that after 1,600 years, the film has grown just one-twentieth of a millimetre thick, according to R. Balasubramaniam of the IIT. In a report published in the journal Current Science, Balasubramaniam suggests that the protective film was formed catalytically by the presence of high amounts of phosphorus in the iron — this phosphorus is as much as one per cent against less than 0.05 per cent in today's iron. There are three stages identified in the protective passive film formation, as outlined in detail in the detailed article on the corrosion resistance of the Delhi Iron Pillar in Corrosion Science, one of the reputed journals in corrosion science and engineering. The high phosphorus content would be a result of the iron-making process practised by ancient Indians, who reduced iron ore into iron with low carbon content by solid state reduction by employing charcoal as the reducing agent. Modern blast furnaces, on the other hand, use limestone in place of charcoal, yielding molten slag and pig iron that is later converted into steel. In the modern process most phosphorus is carried away by the slag. Since lime was not used in the ancient furnaces, a higher amount of phosphorus remains in the material. 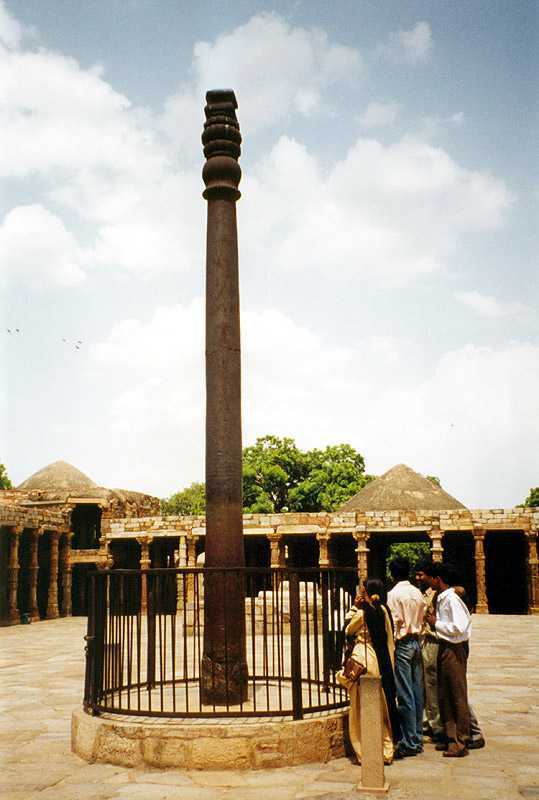 Balasubramaniam states that the pillar is "a living testimony to the skill of metallurgists of ancient India". An interview with Balasubramaniam and his work can be seen in the recent article by Veazy. Another theory suggests that the reason that the pillar resists rust is due to its thickness, which allows the sun to heat the pillar sufficiently during the day to evaporate all rain or dew from its surface. The accumulated heat also keeps the surface dry at night. 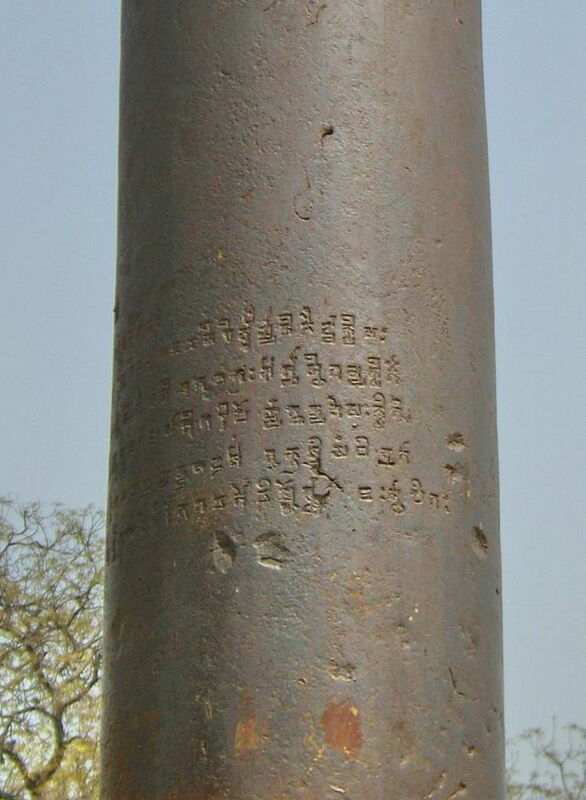 It was claimed in the 1920s that iron manufactured in Mirjati near Jamshedpur is similar to the iron of the Delhi pillar. Further work on Advasi (tribal) iron by the National Metallurgical Laboratory in the 1960s did not verify this claim.